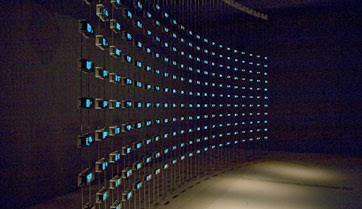 Interesting exhibition on in the Science Museum at the mo - Listening Post claims to be a "dynamic portrait of online communication" by voicing fragments of chat-room conversations filtered in several different ways. This exhibition reminds me of the website I posted a while ago (We Feel Fine) and is another example of a creative way of representing how people interact online. I particularly like the idea of putting a voice (all-be-it an electronic one) to typed conversations. According to the Science Museum website, "The artwork is world renowned as a masterpiece of electronic and contemporary art and a monument to the ways we find to connect with each other and express our identities online." This is brilliant. Art tying digital back to real world is really taking off at the moment. It's a brilliant example of how the virtual and physical worlds are coming back together after a long time apart. It's no longer the physical leading the digital, or the other way around, it's the relationship between them that's interesting.